In Champion winter turns out to be an enchanted kind of time. A solitary sycamore tree shining white with slender arms yearning and reaching upward amid a gray wood along the far side of Auld Fox Creek, blue sky above, makes an admirable photograph. Add the wide rich golden tinted field undulating down to the creek as foreground and the picture takes on the quality of a painting by an old master, fit to be hung in a gallery anywhere. Champion takes its place as a bona fide Beauty Spot (BS) in the Worldwide Scenic Sites Association (WSSA). Whoever invented the calendar? There was a Julian calendar, proposed by Julius Caesar that took effect on January 1, 45 BC. The Gregorian calendar is the one we use now…it goes back to February 24, 1582. There are other calendars: the Jewish one where we are currently in the year 5777, the Chinese one–4715, or the Aztec one, which is said to have been much more accurate concerning celestial observations. However we choose to keep track of time, birthdays of our important people bear some special weight. Young Salem Travis Bluegrass was 20 on the 7th of January, and Sally Goodin Prock had a birthday on the 23rd. Thomas’s Dad, up in Washington, had the 24th and Neda B. Hutsell is a first time grandmother with a birthday on the 30th. Young Zack Alexander celebrated on the first of February. The second is the special day of Punxsutawney Phil of Groundhog fame, Sweet Judy Sharon, Charlene Dupre–Olivia’s grandmother, and Grand grandmother, Connie. Joyce’s favorite Cowboy, Jack, celebrates on the 7th. Skyline students will have their days—kindergartener, Aidan Acree, on the 8th, fourth grader, Joshua Garner, on the 13th, and third grader, Madison Bradshaw, on the 16th. Time seems like an arbitrary way to keep track of things, but it is worth the trouble and even the confusion to be able to acknowledge our lovely people. “I tried so hard to show, my dear, that you’re my every dream, but you’re afraid each thing I do is just some evil scheme,” so sang Mr. Ed Kimbrel at the Thursday Bluegrass Jam. “Why can’t I free your doubtful mind and melt your cold, cold heart?” Mr. Kimbrel is on one side or the other of 90 years old. He has seen a lot in his lifetime. How often have you heard friends, family or neighbors hearken back to the distant past? Certainly, many of those students of the Champion School look back on those days in the 1930’s and 1940’s as some of their most wonderful times. It may be their youth, as opposed to the circumstances of the time that holds the nostalgia. People, uncomfortable in today’s world, are often fond of saying, “I should have been born 100 years ago.” Well, 100 years was 1917 and at that time the country was getting ready for World War One and for the influenza pandemic of 1918 which claimed the lives of 20 to 40 million people worldwide. A children’s’ song of the day was, “Inza, Inza! I opened the window and in flew Inza!” Today we have television, radio, the internet and the print media as our windows on the world and it is truly amazing what all is flying in. As a people with a great eagerness for truth, it is a struggle to sort things out. The Mayflower, for example, arrived in 1620 with our Pilgrim mothers and fathers who were referred to as the Brownists Emigration for the next 200 years. They were religious refugees, English dissenters, early separatists from the Church of England named after Robert Brown. The male passengers drafted the Mayflower Compact establishing a democratic government. It took until 1776 for Thomas Jefferson, his committee and the Second Continental Congress to write the United States Declaration of Independence. It was a disappointment to some that it was not a more overtly Christian document. There is no reference to Jesus Christ, no quotations from the New Testament, nothing more than four vague references to God which reflected the theistic world view of the British-American colonies in the 18th century. Politics and religion are interesting studies, but perhaps not suitable for polite conversation. Remember the contact information for your government representatives if you have something you wish to discuss with them: The White House (202) 456-1111 or (202) 456-1414, Governor Greitens (573) 751-3222, Roy Blunt (202) 224-5721, Claire McCaskill (202) 224-6154, Billy Long (202) 225-6536, Jason Smith (202) 225-4404 and Paul Ryan, 700 St. Laurence Ave., Janesville, WI 53545. Polite conversation in the Meeting Room at the Historic Emporium has to do with local history, the weather, the difficulties of winter time farm chores, the antics of grandchildren and health issues. A young Champion fellow (3 years old) named Chase has become the official greeter at the store. He likes to open the door for customers and is a good hand shaker. He has been disappointed for several Wednesdays in a row not to get to see the General. The General is called back to work from time to time and, most recently, was spending his Wednesday in West Plains with his sweet mother-in-law, Lucille. She was ready to get back home and Chase is ready to see his buddy again. Perhaps Chase will bring his guitar if the General will bring his. Maybe Ethel of Omo will get her Bob to bring his mandolin banjo for its regular tuning and perhaps some old Gene Autry song will come out of it. Very good news comes about the Prominent Champion Girlfriend. Her serious heart problems are going to be controllable and she said, “Still have a few little issues but all in all I’m going to be around for a long time. Thank you all very much for keeping me in your prayers & thoughts.” Smiles are the order of the day. Nanette Hirsh from the Douglas County Health Department has a great smile. She will be at the Skyline School on Tuesday morning the 6th of February to do blood pressure checks and other health screenings. More smiles come from Linda Keys and Marjorie Carter over at the Downtown Pawn Shop on the east side of the square in Mountain Grove. They have always been most generous in their support of the Skyline Volunteer Fire Department. Now they are pleased to be offering genuine Champion Post Cards for a mere four bits—the very same price as those at Henson’s Downtown G & G on the North side of the Square in Downtown Champion. Linda and Marjorie have family history at Champion and a great appreciation for the beautiful place. Gary Hutchison has history here as well. He has again shared his copy of Darrell Hayden’s song, “All the Late News from the Court House,” and Eric Stevenson of Edinburgh, Scotland has shared his song “From Galloway to Graceland.” Look for the lyrics of both songs in a special post at www.championnews.us. Look there too for ten years of past Champion news and for future proclamations of the Champion Ethics Committee (CEC) which will have its first meeting Wednesday. Enjoy the stunning winter scenery on the wild, wooly banks of Auld Fox Creek because it is soon to change in Champion—Looking on the Bright Side! After a couple of days of much enjoyed sunshine, Champions were blessed with a gentle all day rain, the kind that soaks in and trickles right down through the limestone into the aquifer. It is the kind of rain that combines with a brisk wind at 47 degrees that smacks of winter but is just followed by the promise of a few moderately seasonable days. What Champion complains? Neighbor Brenda Coffman Massey spent the part of Sunday the 22nd in thanking friends and family for good birthday wishes. She has a great smile and is routinely busy in her own neighborhood and neighboring ones doing good works. The last Tuesday of the month on the 31st will find Nannette Hirsch at Champion again taking blood pressure readings and giving good health advice to people with questions. The 31st is also the day Skyline will have a basketball game at Plainview. The Thursday night bluegrass jam at Vanzant was well attended in spite of a heavy fog. After a great pot luck supper, forty or so folks sat back to hear music produced by singers and players of 8 guitars, 3 mandolins, 1 banjo, 1 fiddle, and 1 bass fiddle. The lead went around and around the circle for a couple of hours until 32 songs had been sung and played. Sherry Bennett coaxed a gentleman from the audience, Mr. Ed Kimbrell, to sing “I Saw the Light” and the crowd joined in with enthusiasm. He said that it had been a long time since he had sung into a microphone. He lives over near the old Richville Store on W Highway and hopes are that he will be a regular at the jam in the future. Music is a gift. Some of the good news that reaches Champion comes from Nickelville, Missouri. Enbridge Energy says that 365 barrels of crude oil that spilled out onto farm land when electronic monitors failed to detect the leak, well, they did not say it was cleaned up but they did say that oil was flowing again and that the company is monitoring local wells and ground water in the area. 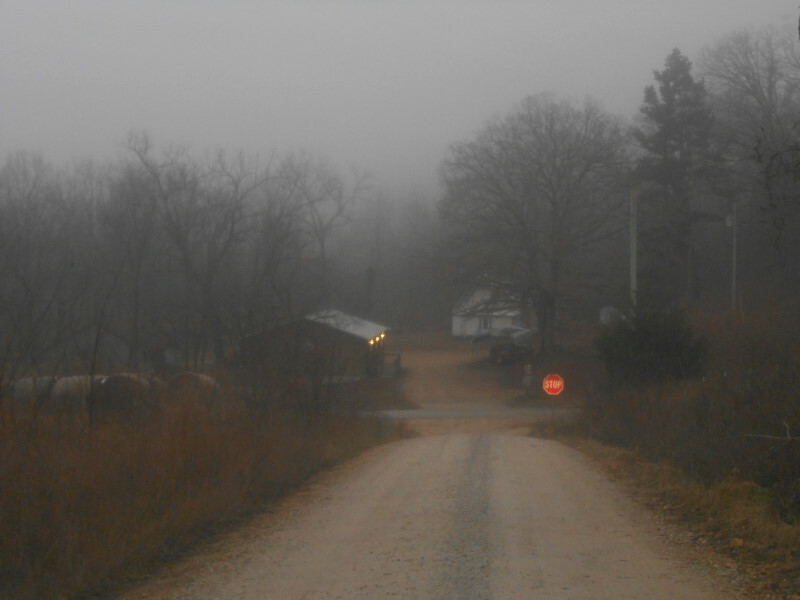 Highway M, which was closed south of Highway Z in rural northeast Lawrence County on Tuesday, reopened to traffic Thursday. These things happen. That is the concern of the Standing Rock Reservation folks, still occupying land they own as they attempt to protect their water and the water of millions downstream. Other indigenous peoples around the Nation and around the world are having similar struggles as they try to protect their land and water. 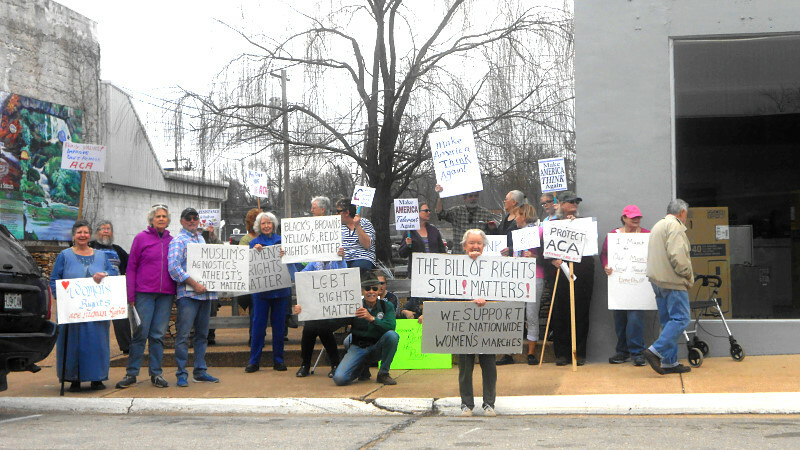 “The Bill of Rights Still Matters!” “Women’s Rights are Human Rights” “Protect the ACA” “Make America Tolerant Again!” These were some of the signs at the women’s march in Willow Springs on Saturday. The thirty or so participants did not so much march as stand out on the sidewalk by the Star Theatre and entreat passersby to honk for health care or to signify that they love women. Nationwide they say that one out of every hundred people were engaged in the women’s march. There were no reports of violence anywhere. In 673 such marches around the world they say there were 4,814,000 global participants. This has been a well-reported event and is certainly one of the largest gatherings of our times. Back in 2003, between January and April of that year, thirty six million (36,000,000) people worldwide protested the bombing of Baghdad. News coverage was not nearly so attentive to that and local television reporting consisted of, “Oh, and there were some protests.” The internet was not such a big part of the lives of average citizens then as it is today. The chances of getting accurate information are better if it is gathered from a variety of sources. “Trust, but verify” was a popular saying back in the Reagan administration. From every side it is advisable to step outside your particular comfort zone of preconceptions to see what friends, neighbors, and kin-folks consider to be the truth. It might be eye-opening—Champion. Look back over the past decade of The Champion News at www.championnews.us and look out over the wide, wild, wooly banks of Auld Fox Creek for a view of one of the world’s truly beautiful places. “Wait till the darkness is over. Wait till the tempest is done. Hope for the sunshine tomorrow after the darkness is gone. Whispering hope, Oh! How welcome Thy voice–making my heart in its sorrow rejoice” in Champion—Looking on the Bright Side! The red, blue, white, gold and green lights reflected on the wet tarmac were a dazzling sight as Champions recovered from the turbulence that brought them through the clouds Sunday evening. Those wheels touched the earth again and the g-forces pressed against the seat belted bodies as the brakes slammed on and the engine noise suddenly roared to mark the end of a great adventure. The industry that makes this kind of mass transportation possible is peopled by hard workers. There are good and bad stories to be told, but the bottom line is the pilot was not dazzled by those lights and brought us safely to ground again. During the First World War the British were losing so many ships to the German U-boats that some Scotts and Brits got together with artists to devise a clever camouflage. Since it was impossible to make the ships invisible to the periscopes of the submarines, the idea was to disguise the intention of the vessel. They did that with broad swathes of contrasting colors—black and white, green and mauve, orange and blue-in geometric shapes and curves to make it difficult to determine the ship’s actual shape, size and direction. 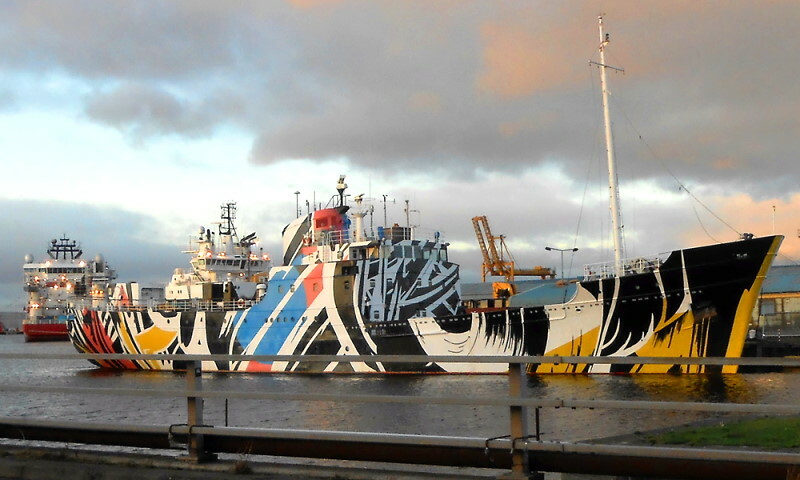 These were called the Dazzle Ships. It is remarkable how inventive people can be when working together against a great foe—dazzling—Champion! The General kindly reported on the Vanzant Bluegrass Jam of last week and said that, due to the weather, only about thirty people showed up. Fortunately, he said, “…eleven of them were singers and musicians.” With so few in attendance he might have been persuaded to play himself, but he is so shy. It takes some real coaxing to get him out of his shell. The Edinburgh jam happened on Wednesday in a tiny little kitchen and included violin, guitar, alto recorder and accordion. Traditional pieces, original works and old standards were on the set list including “Ashoaken Farewell,” “Please Don’t Talk About Me When I’m Gone” and “The Sunny Side of the Street.” Most every day of the last month found sunny days there with temperatures ranging from high 30s to low 50s, frequently with vigorous cold wind. In addition to music, that little kitchen turning out one lovely meal after another—hearty satisfying dishes and puddings—great wonderful puddings. Jacob Kyle Brixey is in the first grade at Skyline. He shares his birthday on the 18th with a couple of very nice grown-ups–J.C Owsley, a stalwart gentleman often on a big white mule, and Mary Beth Shannon, whose Facebook profile picture is a thistle flower. She has a sweet smile that says, “Thistle do nicely.” Champions gathered around the wood stove in the Meeting Room of the Historic Emporium will celebrate on the 19th just for the fun of it. The 19th is also the Pack the House ball game at Skyline. The Buzz is that charming little grandmother Sharon Woods will enjoy her birthday on the 20th. Kyle Barker is a 4th grade student at Skyline with a day to celebrate on the 21st. That is also the day of Skyline’s archery meet at Taneyville. Elizabeth Hinote is a 2nd grade student whose special day is on the 22nd. Oliver Holden Moses is an accomplished percussionist off in school in Interlochen, Michigan. He will be celebrating his birthday on the 23rd. From the 23rd to the 27th the Skyline Boys’ Basketball team will participate in a tournament in Taneyville. Cody Coonts is a prekindergarten student at Skyline with a birthday on the 25th, shared by Mrs. Coonts who teaches middle school at that fine institution. Brooke Johnson is a 5th grader there and celebrates on the 26th. That is also the special day of Cowboy Jack’s favorite special Joyce. A lovely alumnus of Skyline is Kaye Alexander who will party significantly the 27th. Prize winning archer Erika Strong is in the 4th grade. Her birthday is on the 30th. James Brixey was 40 on the 30th in 2012. Do the math and congratulate these fine folks for having whirled all the way around the sun again! A bill to classify people who protest against actions of corporations as ‘economic terrorists’ is said to be up for a vote in North Dakota. That would give the corporate owned government officials permission to use the militarized police force against the prayerful, peaceful, water protecting citizens with lethal force if they choose. Redacted so as to accommodate the current political landscape, a favorite Champion submits the following rendition of that famous document created by the Committee of Five in 1776: “When in the course of human events, we find these truths to be self-evident; all are created equal, endowed with certain unalienable rights, liberty, and the pursuit of happiness, we appeal to native justice and magnanimity, conjure the voice of consanguinity, and mutually pledge to each other our lives, our fortunes, and our sacred honor.” It reads like free verse. If you want to have a voice in matters that are important to you, participate via telephone: Roy Blunt (202) 224-5721, Claire McCaskill (202) 224-6154, Billy Long (202) 225-6536, and Jason Smith (202)225-4404. They represent us and are required to act in our best interest. Encourage them by telling them what you think. Home is that notion that is most venerated among beliefs, philosophies and observations of what might be considered to be the truth. It is said to be that place that when you return to it, they have to let you in. Travelers returning from distant places at this time in history arrive with mixed emotions, having seen the place from afar through the eyes of others. Those others do not see the beautiful rolling hills, the woods and streams or the little house nestled on the side of the hill. They see the nation the way we see France or Argentina, Belgium or Japan. Many of them seem a little worried for us. Champions, loose out in the big world, appreciate and understand their concern and will adopt the motto of the city of Leith, “So with our darkest days behind us our ship of hope will steer and when in doubt just keep in mind our motto PERSEVERE.” The ability to persevere is a hallmark of the settlers who meandered into this part of the country back around the turn of the last century. Share the stories of your grandparents (at champion@championnews.us or at The Champion News, Rt. 72 Box 367, Norwood, MO 65717) as they participated in the hard work of preparing this lovely place for you to sing about, “Mid pleasures and palaces though we may roam, be it ever so humble, there’s no place like home” in Champion! Looking on the Bright Side! 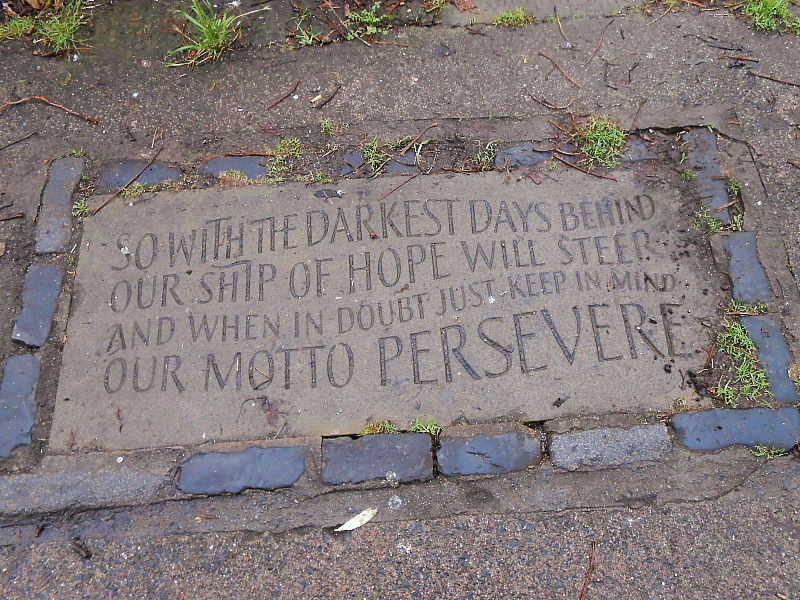 One of the five stones in the panoply of platitudes along the Water of Leith. 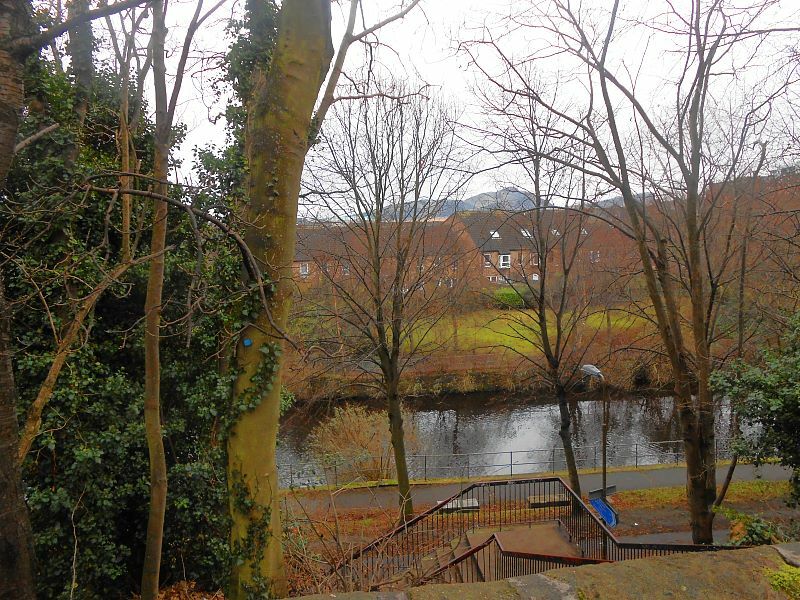 Looking out across The Waters of Leith to Arthur’s Seat in the distance on another sunny day in Scotland. Good news comes from Champion’s hub that the New Year has begun well and that the weather is on a warming trend. Lannie Hinote had great adventures getting back to Mountain Village, Alaska. It seemed like travel took about half her vacation, but the rest was great. She posted, “I would like to thank all my friends and family for a great Christmas vacation… all that shared ballgames with me…cooked me some suckers and peach pie…let me help them build a gingerbread train…the card games and Fudge…eating out and the relaxing visits…” She will be back in the summer ready for more fun, but meanwhile, she is teaching and coaching in a place even more rural and remote than Skyline. She and our wonderful Skyline teachers and staff are doing some of the hard work in the world. It takes special people to ride loose heard on our children, to instruct them and to give them the tools they need to become good citizens. The chance to thank a teacher, board member, administrator, cook, maintenance person, or bus driver is one that few Champions will pass up this year. They know how far a little recognition and encouragement can go. Appreciators of Lonesome Dove and Augustus McCrea will be happy to acknowledge the birthday of the actor Robert Duval. He has played many sympathetic characters and a few bad villains. It may be news to some that he is married to a lovely Argentinean woman and is an aficionado of the tango. His birthday was January 5th. Elvis’s birthday was the 8th of January. Mr. Eric Stevenson has been singing at The Royal Oak twice a week for more than 30 years and has written a song about an Irish girl who came from Galloway to be with the king. She became obsessed with Elvis. It is lively ballad that The Champion News will endeavor to share. Mr. Stevenson gives permission, but has not yet shared the lyrics. Along with Elvis on the 8th of January, thoughts often go to Jimmy Driftwood and The Battle of New Orleans. It is not a very popular song in Great Britain, though the Scots might like it. Elizabeth Johnston has some fiddle experience and a birthday on the 9th. Phillip Moses celebrates that day too, watching his flock of chickens grow. Tom Van Dyke has visited Champion over the years and will hopefully feel like doing it again this year. His birthday on the 10th. Teeter Creek herbalist Bob Liebert celebrates on the 11th and so does Wilburn Hutchison, who lives just a couple of hundred yards from where he was born, but that was some while back. Elmalyn Masters and her brother, Willis, have both passed away now. Their birthdays were on the 12th and 14th. Diane Wilbanks celebrates on the 13th. She has a sweet smile and a big heart. Norris Woods was like that too, and the 13th was his birthday. Father Bert Godkin has the 15th as his day. Miley Schober shares her birthday with Skyline third grader, Aaliya Irby on the 16th. Skyline Coach Davault celebrates that day too. Recently a little girl was born and was given the name Ava. It turns out that her Great Auntie Brook Quiet Timber is celebrating her birthday on the 17th along with Rese Kutz who was four on his birthday last year, also on the 17th. Happy birthday all you special people. Know that you are Champions, loved and remembered. News came across the ocean that the Vanzant Bluegrass Jam was canceled last week on account of the weather. Generally, if school is canceled, the jam is too. 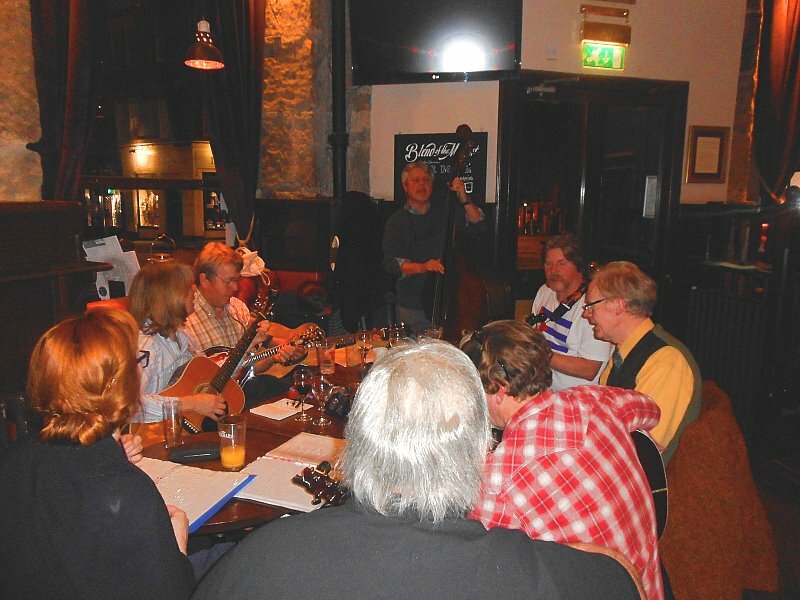 Here in Edinburgh there is a first Thursday of the month bluegrass jam in a posh pub on the low end of the Royal Mile at #1 High Street. About 8:30 in the evening musicians started drifting in and by 9:00 there were 4 guitars, 4 mandolins, 2 fiddles, 1 base fiddle, 1 dobro, and one banjo playing in Betty’s Bluegrass session. There were many familiar songs and many new ones to the foreign ear. They were all played with the enthusiasm and good humor associated with that genre of music. Erelong, perhaps as soon as in a couple of weeks, there will be videos of this wonderful jam and of other exciting musical times in Fair Edina up on the website at www.championnews.us. Look for the announcement here. Look there for a decade’s worth of The Champion News and examples of our sweet local music. Across the wide Atlantic, friends are enjoying a video of young Dylan Watts with his banjo singing, “I Traced Her Little Footprints in the Snow.” He is a credit to his Granddad and a joy to the family. With 120 more days of winter ahead in the Northern Plains, water protectors in the Standing Rock Sioux camp were grateful to Henry Red Cloud from the Pine Ridge Reservation when he and others installed eleven solar powered furnaces to help the activists stay warm. They are outside all day and the temperatures have been brutal. A pipeline leak discovered by a landowner when the electronic monitoring failed in early December had already let 130,000 gallons of the 176,000 gallon spill flow into Ash Coulee Creek which feeds into the Little Missouri River. They have been able to catch about 40,000 gallons of it, but they say that it will be spring before it is cleaned up. A spill in September of 2013, which let go 840,000 gallons of oil is still being cleaned up. That is all right, though. The Texas company behind the Black Snake says it is ‘safe’ and the archeologist they paid so well to survey the land probably would not mind if the graves of their own grandparents and great grandparents were bulldozed. The Edinburgh Tool Library is the UK’s first tool library, promoting sharing as a way of reducing environmental impact. They lend tools to members for DIY carpentry projects, for gardening, decorating and machine repair so that they do not need to own all the tools. It is a collaborative approach that makes sense environmentally and it gives members access to over 500 tools without the need to store them, maintain them, or buy them in the first place. Membership dues are minimal and the young people running the place are full of good ideas like “borrow-learn-give-teach.” Most of the tools have been donated and there is an active program to have older people with various skills teaching younger people how to do things. They had an open house on Friday evening with tours of the workshop and offerings of opportunities to volunteer. It all sounds like good neighboring in Champion. 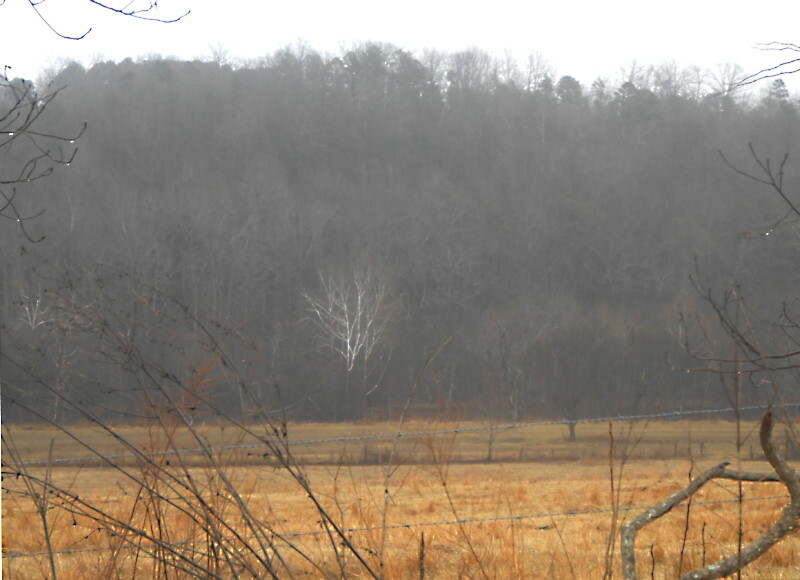 Come down to the wide, wild, wooly banks of Auld Fox Creek and meet your fine neighbors. If it is sunny, stand out on the wide veranda for gander at one of the world’s truly beautiful places. If it is cold, sit around the old wood stove and listen to your interesting neighbors spin yarns. Spin your yarn at champion@championnews.us. “Can’t you hear the night birds crying far across the deep blue sea? While of those others you are thinking, won’t you sometimes think of me? Don’t that road look rough and rocky? Don’t that sea look deep and wide?” Don’t Champion look just like Heaven over there on the Bright Side? 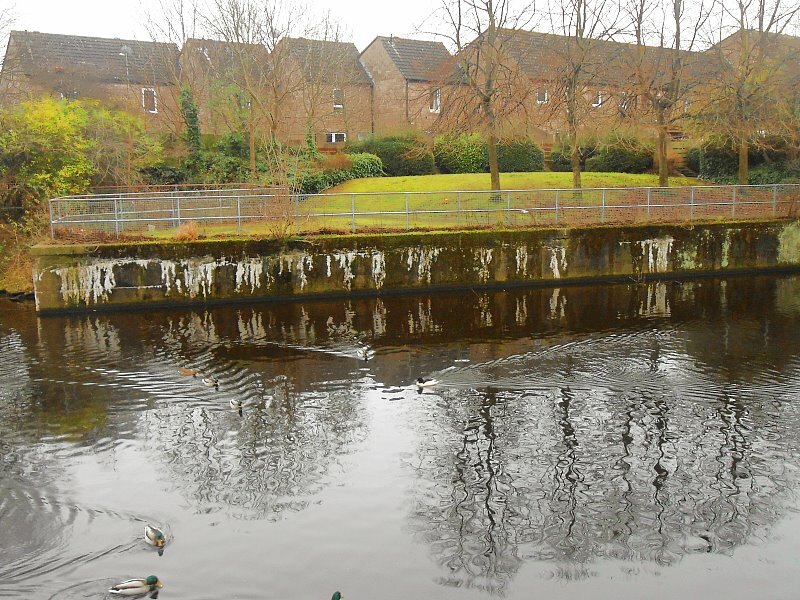 Ducks out on the river.